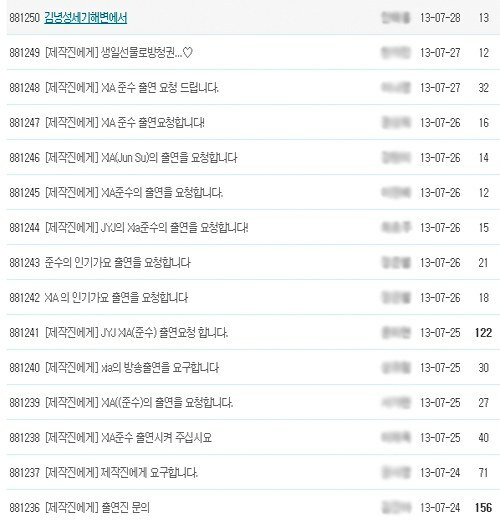 The viewers’ request page of SBS’ ‘Inkigayo’ has been flooded with fans asking for JYJ’s Junsu to appear on the show. This has been happening for all three major music programs, including KBS’ ‘Music Bank’ and MBC’s ‘Show! Music Core’. JYJ left TVXQ in 2009 and since then, have been unable to appear on broadcasted music programs due to external pressure. The FTC recently found SM Entertainment and the Korean Federation of Pop Culture and Arts Industries guilty of interfering with JYJ’s activities. With the FTC’s verdict made on the 24th, JYJ’s fans began expecting to see JYJ on stage in the near future. However, the staff of the show have stayed silent, regardless of the viewers’ requests. Although it has become the hottest issue of the week in K-pop, not a single staff member of any broadcasted music program has expressed his or her opinion on the matter through official posts, SNS accounts or news articles. In order to ‘strengthen communication with viewers’, all three major broadcasted music programs have incorporated SNS points, and text message votes into their ranking systems, but they have stayed silent when it comes to requests made by the viewers themselves. Broadcasting companies use viewers when they need to, but do not reflect their requests or opinions at all. Another viewer stated, “Legally, all restrictions against JYJ have disappeared,” and “We hope that the media remembers that their most important role is to promote fairness.” It is time for the staff of music programs to express their official stance to gain the trust of their viewers. The Korean broadcasters are cowards. We want JYJ too ! Please sign the petition to allow JYJ to perform on Korean music programs!